This post was contributed by guest blogger, Jay P. Morgenstern, Ph.D., Director, Genetic Engineering & Molecular Biology at Warp Drive Bio. The post is in memoriam of his late father and pBABE’s namesake, Harold (Babe) Morgenstern. Dr. Morgenstern reached out recently to tell us the story of his incredibly popular retroviral vector pBABE-puro. Read on to learn more about the fascinating history behind this vector which has helped launch countless research projects and which represents a lasting tribute to Dr. Morgenstern’s late father, Harold (Babe) Morgenstern. Well, it was way back in the mid 1980s and Dr. Hartmut Land had set up shop at the Imperial Cancer Research Fund (ICRF) laboratories at Lincoln’s Inn Fields in London with me as his first graduate student. As alumni (he as a postdoc, I as a technician) of Bob Weinberg’s lab we were interested in expanding on the concept of oncogene cooperation (Land et al., 1983). We initiated research on expression cloning of novel oncogenes beyond ras and myc. For this purpose we needed vectors that could stably transduce and express genes at high enough efficiencies to stand a chance of representing the complexity of cDNA libraries derived from tumors. In addition, to study the biology of myc in detail via collaborations with labs headed by William Lee and Gerard Evan we needed vectors with orthogonal selectable markers to enable simultaneous stable expression of multiple genes. Building on pioneering work by Connie Cepko & Richard Mulligan as well as Dusty Miller’s lab, we set out to derive retroviral vectors that would yield the highest titers whilst minimizing the chance of recombination that would lead to replication competent retrovirus. When we arrived at the final vectors (including one of the first to confer resistance to puromycin, vastly decreasing the cost of stable selection relative to the then heavily used neomycinR/G418 tandem selection) we had to name them. It so happened that the genesis of the vectors coincided with the 60th birthday of my father, Harold Morgenstern, better known by his nickname of “Babe” (he was the youngest in the family and he was born when the legendary baseball player Babe Ruth was in his prime). So it seemed a fitting tribute to honor him (the man who paid for my college education) by naming the vectors after him. 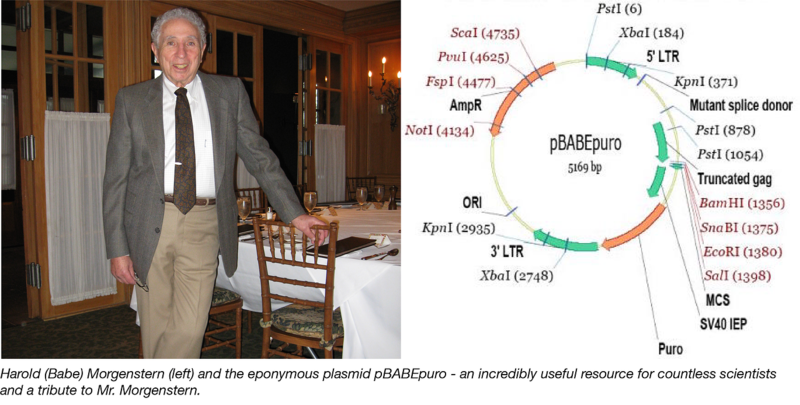 The rest, as they say, is history: pBabe vectors have been used in innumerable studies and cited in over 2,150 publications during the past 30 years. The original empty vector has been distributed over 1,400 times alone and, with many of it’s derivatives Blue Flame Plasmids themselves (>100 orders each), this vector has aided countless researchers - a fitting tribute to my late father. Many thanks to guest blogger Jay P. Morgenstern, Ph.D., Director, Genetic Engineering & Molecular Biology at Warp Drive Bio.